The tradition of what Melodic Interest creates on Looking Forward is an exploration in a colorful, rather artistic manner; where we the listener find something unusual; even new, as it leans rather heavily towards the Imdadkhani Gharana of the Hindustani tradition. The reason is quite simple and can be best experienced on “Adolescence” where sitar maestro Hidayat Khan (son of the Imdadkhani Gharana’s most famous exponent, Vilayat Khan) holds sway with ‘tabalchi’ Enayet Hossain. Let’s face it the kind of music created by The Mahavishnu Orchestra, Shakti and other incarnations of groups like Melodic Interest has had its origins since the advent of the Mughal Period in Indian history – notably during the time of Emperor Akbar. The collision of cultures belongs, of course, to a much earlier time, when Earth was a less settled place, migrations were more rampant, but curiously, populations and cultures were more accepting of differences. So the Psalms that came to be written by King David and others came to be the basis of modern psalters and hymnals where the cultures of Africa and the Middle East and Europe collided. However, it was the separation of the sacred and the secular in the pre-Christian, Semitic traditions of Judaism and Islam that made for the most fascinating strides when they came into contact with polytheistic cultures such as India, where the separation of church and state didn’t really exist and the Sufi’s ecstasy had become one with the secular through the music of both Kabir and Tulsidas. The more recent melding of the pure African and the interpreted African-American idioms of Jazz was eased into the music of the sub-continent because in some mystical way, it already existed a very long time ago, since the proverbial ‘time immemorial’. On “Keys of Resolve,” as on “Jazzy Streets of Mumbai” before it, the ghost of saxophonist Joe Harriott looms large as saxophonist Fred Koch and organist (and pianist) Greg Hatza strike gold. “Jazzy Streets of Mumbai” is also unique in that it attempts – rather successfully – to create a more visual approach to this soundtrack. Anyone who knows Mumbai will understand why a “visual” approach is the only way in which the character of that city can be brought to life and this is rather splendidly done by Melodic Intersect not the least because of the imagination of the musicians who perform great virtuosic feats on individual instruments. 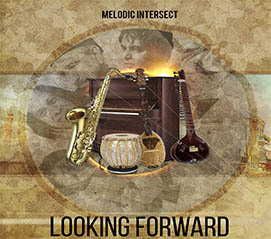 Oddly enough it is “Jazzy Streets of Mumbai” and “Rhythmic Paths” – two of the most contemporary pieces on the disc – which are the most traditional in terms of the music – the alaap introducing the melody of the former piece and the melding of a teen tal and jhaap tal that courses through the latter piece. Interestingly, both pieces are informed by exquisite interpretations of melody, harmony and rhythm. Of course, the performance of each of the musicians is what makes this disc eminently desirable. Overall, Looking Forward is a giant step forward in the richly growing discography of this cohesive and empathetic ensemble. Its continued catalog of richly conceived offerings is a continued clear testimony of their strengths as a potent group. Thank you for this wonderful review! Much respect to you for your knowledge in Indian music!